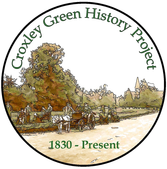 Ernest was born in Croxley Green to parents Joseph and Frances Groom. Joseph 23 years and Frances 27 years were married locally at All Saints church on 26th January 1889. 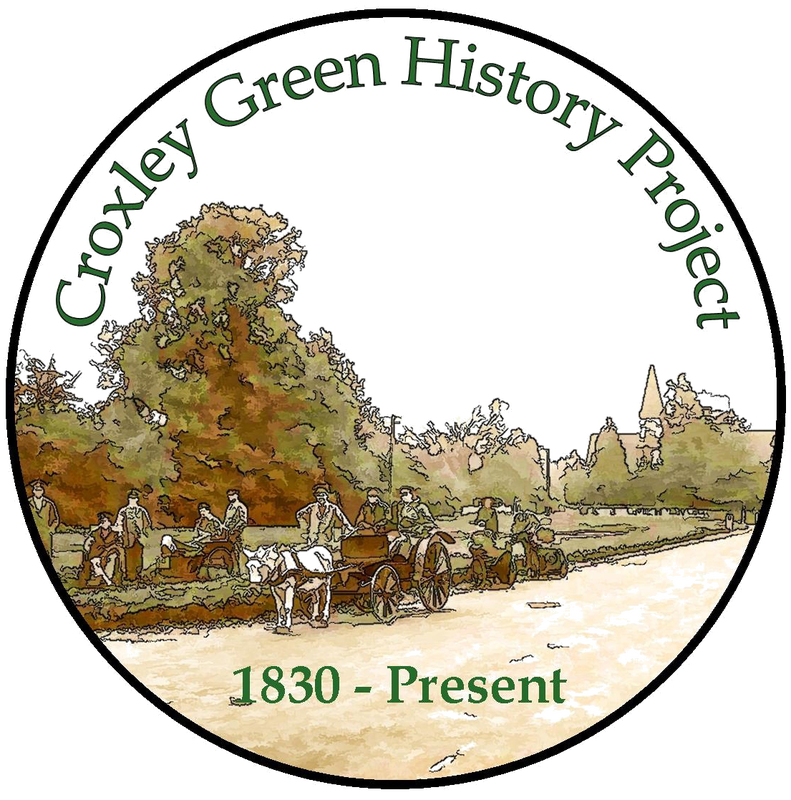 At this time Joseph was employed as a cowman and although Frances is recorded as a spinster in the church marriage records, the family believe she came to Croxley Green in 'service' possibly as a maid in one of the large houses in the village. Frances father had also been in service, employed as a butler. The 1911 census shows us that Ernest 18 years , worked as a grocer's shop assistant. Family members believe this to be at the Co-operative in New Road. 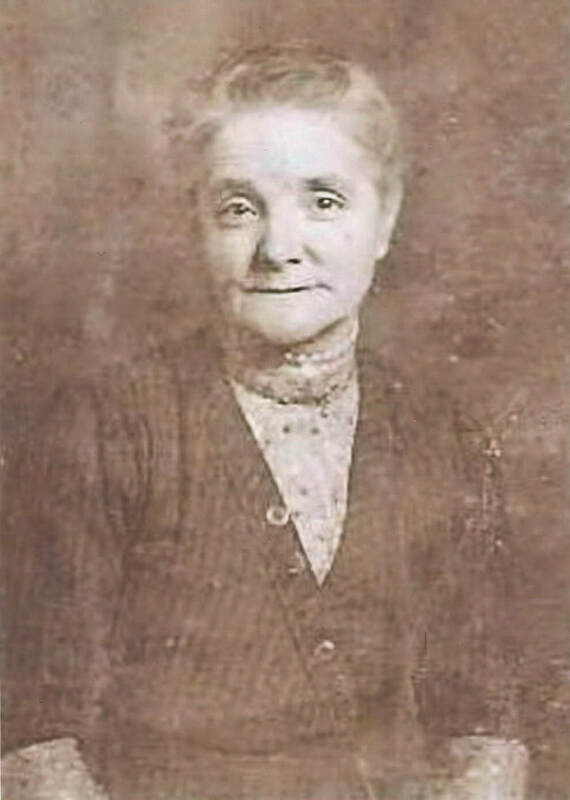 Ernest's father now worked at John Dickinson paper mill as a paper packer with his daughter Hilda 16 years, a paper sorter and his son William 14 years, a paper cutter. 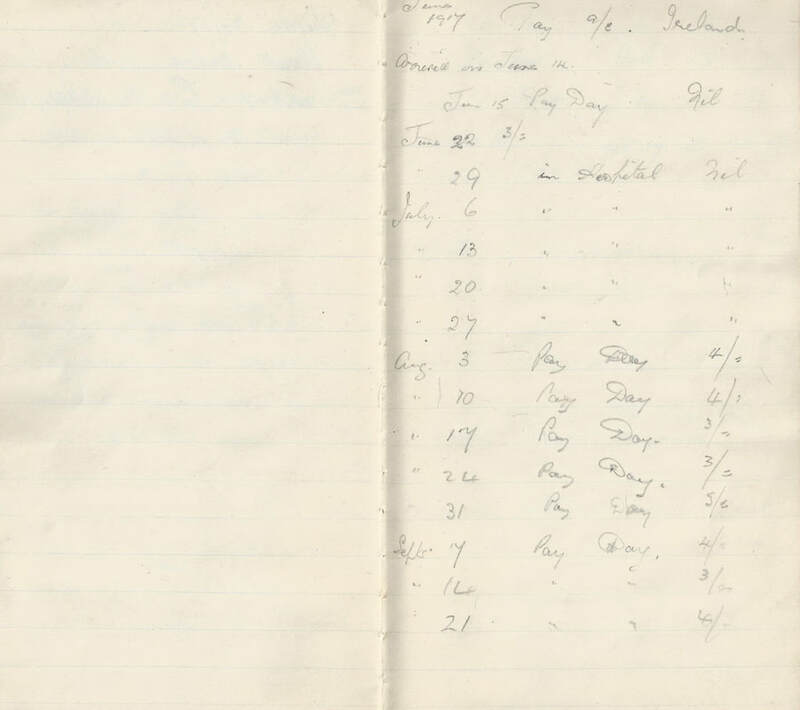 The census also reveals Ester, at school 11 years old and the family were living at 124 New Road. Earlier census indicate Joseph and Francis had another daughter Lucy, who would have been 21 years in 1911.
posters around the country were appealing for men to join the British Army. 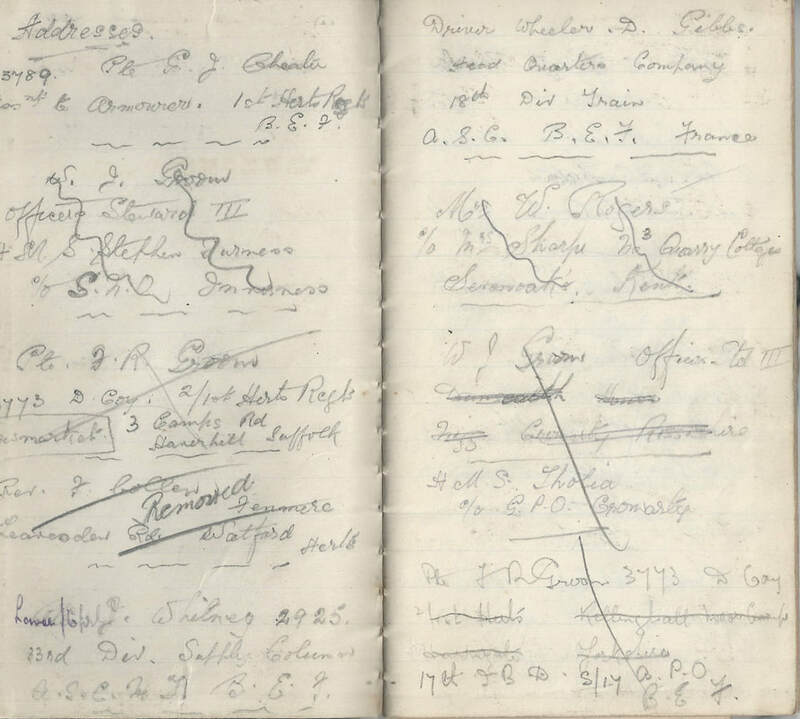 Ernest travelled to Hertford and enlisted on the 22nd November 1915. 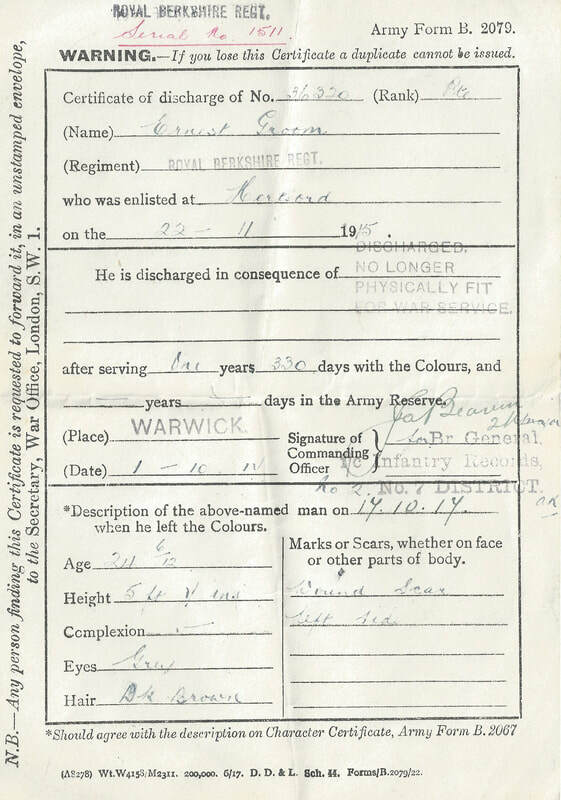 Conscription however soon followed, introduced in March 1916. 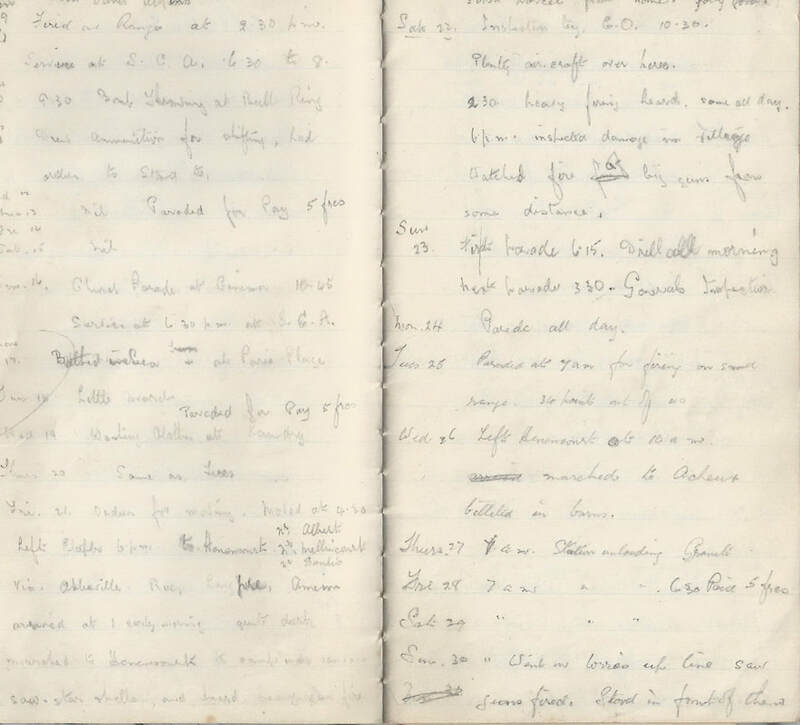 From the date of his enlistment, knowledge of Ernest's early whereabouts in the army is unsure, but he did keep a diary which has been carefully transcribed by family members. 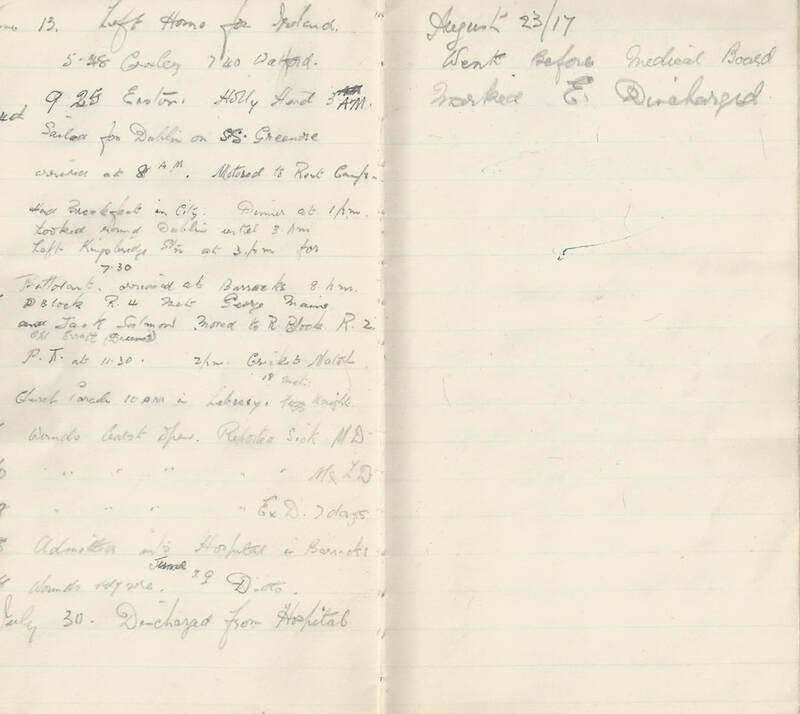 The dairy begins in June 1916 and starts with Ernest at Halton Camp . 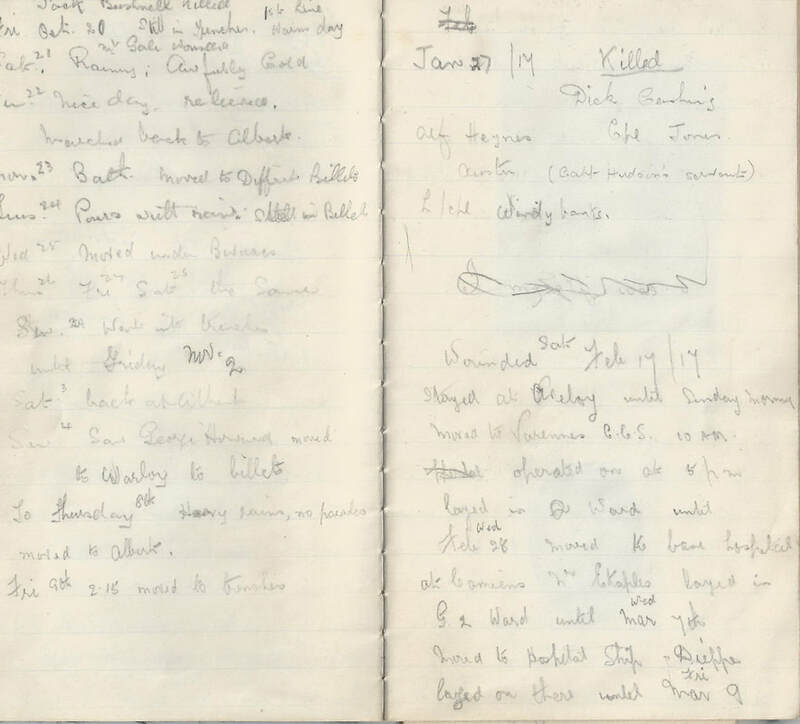 ​The following is Ernest's diary as transcribed by members of the family (2018). 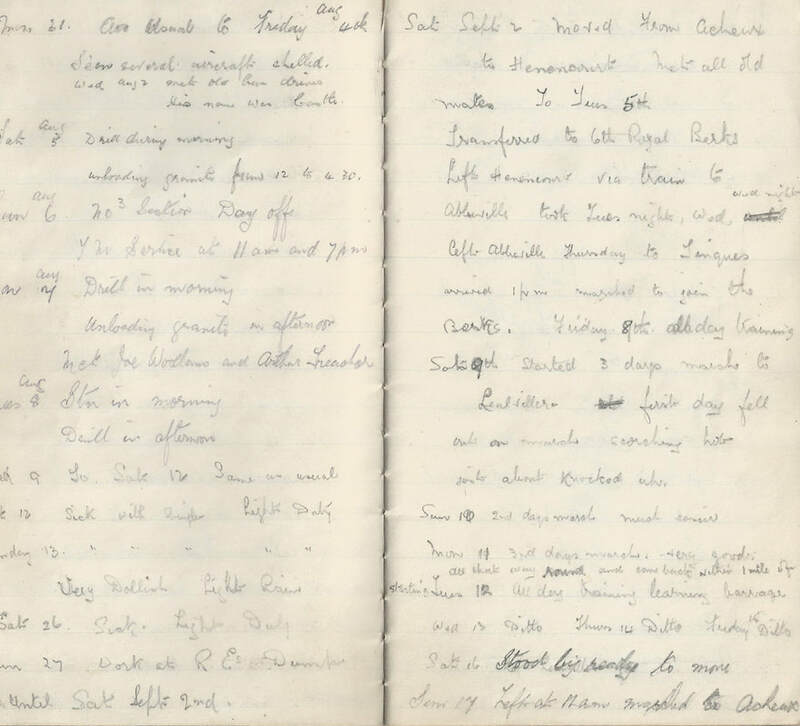 As Ernest had just a pencil to describe his events, the writing has faded and in places difficult to determine his handwriting, particularly some names in France etc. Ernest may well have not known the correct spelling and wrote them phonetically. The family have done their best to locate and correct any spelling. 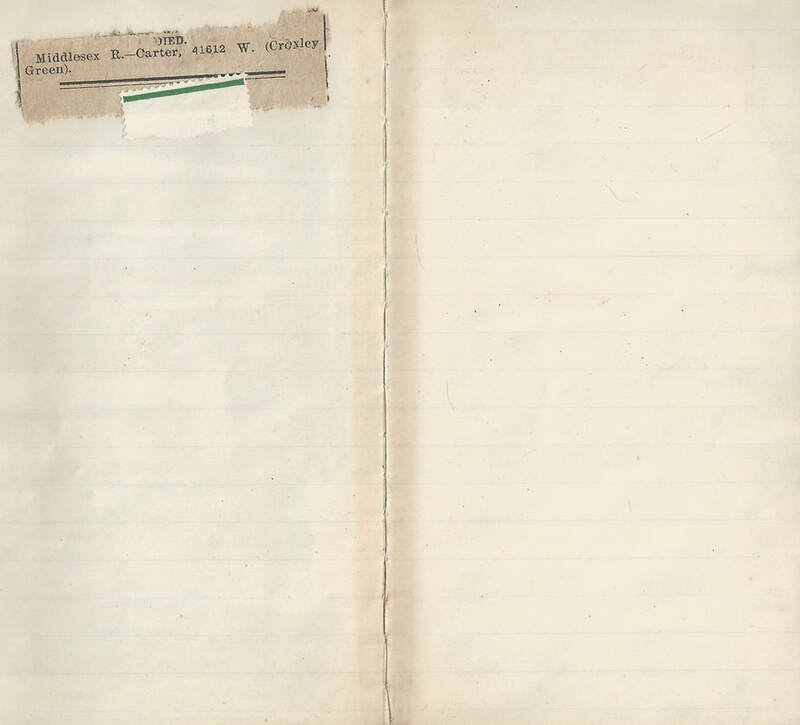 The website has placed in square brackets [ ] extra information regarding Ernest's diary entries. 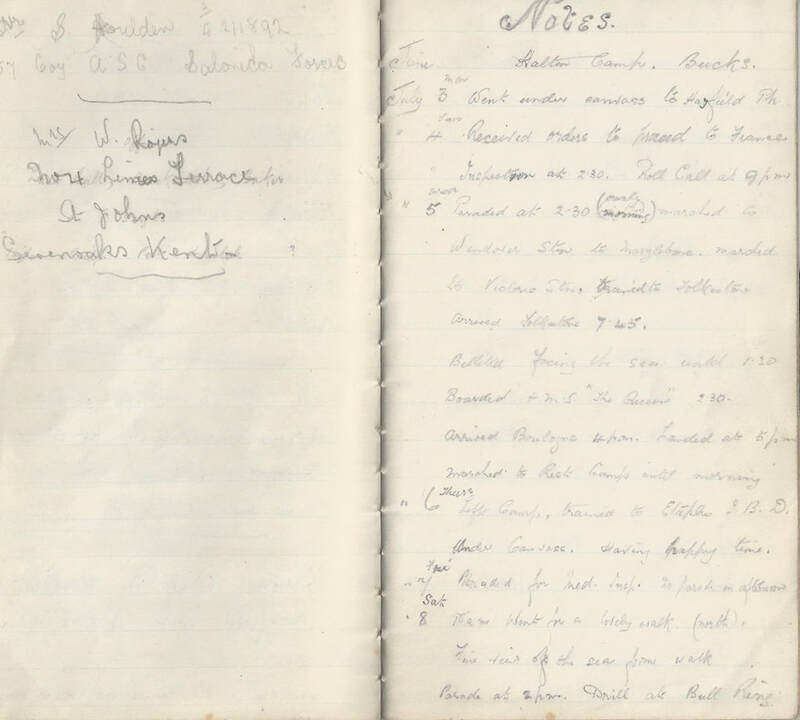 ​Ernest's diary is still in remarkable condition and although the pencil has faded with age the paper in the note book is still very stable. 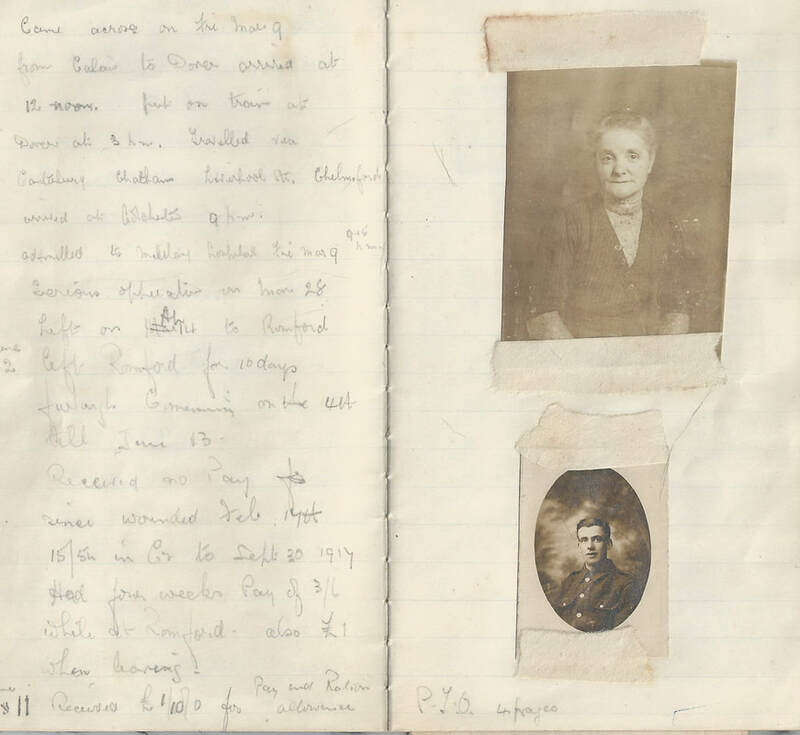 Two photographs are attached in the early section of Ernest's notes and the family believe they are his mother Frances and his brother William,who also served in the army. Received orders to proceed to France. Inspection at 2.30. Roll call at 9pm. Paraded at 2.30 (early morning) marched to Wendover Station to Marylebone. Marched to Victoria Stn, trained to Folkestone. Arrived Folkestone 7.45. Left camp. Trained to Etaples I.B.D. (Infantry Base Depot)Under canvass. 10am went on a lovely walk (north). Fine views of the sea from walk. 11th July Drew ammunition for shifting. Had orders to Stand too. 21st July Friday Orders for moving. Moved at 4.30. Arrived at 1 early morning. quite dark. Saw star shells and heard heavy gun fire. First parcel from home, jolly good. Next parade 3.30. Generals inspection. 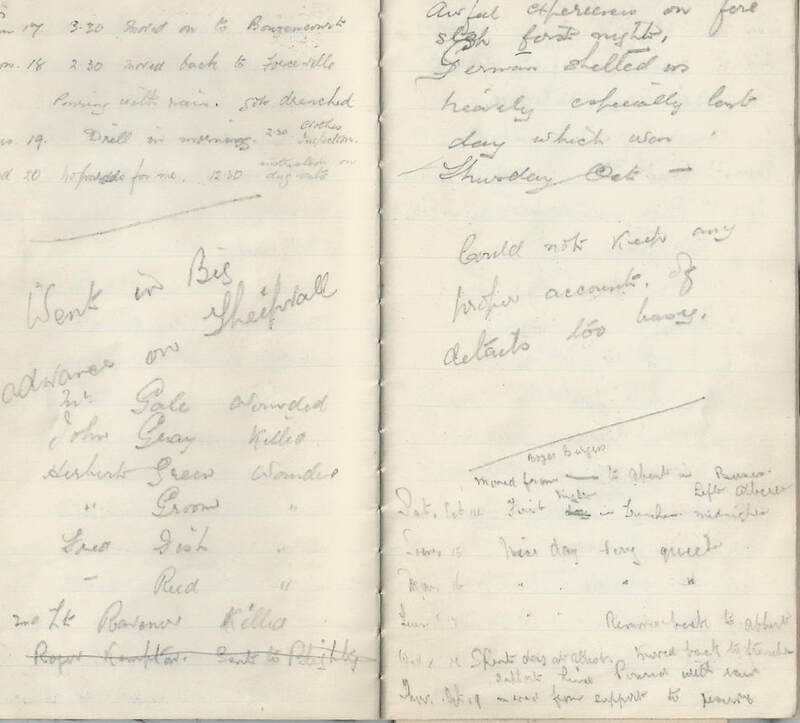 30th July Went on lorries up line, saw guns fired. Stopped in front of them. 5th Aug Drill during morning, unloading granite from 12 to 4.30. 6th Aug No.3 Section Day Off. 26th Aug Sat Sick, light Duty. 7th Sept (Thurs) Left Abbeville to Tincques arrived 1pm, marched to join the Berks. 9th Sept Started 3 day march to Lealvillers. 17th Sept Left at 11am marched to Acheux. Moved from ________ to Albert in buses. Left Albert midnight. Spent day at Albert . Moved back to trenches. Came across from Calais to Dover, arrived at 12noon. Put on train at Dover at 3pm. Travelled via Canterbury, Chatham, Liverpool Stn., Chelmsford. 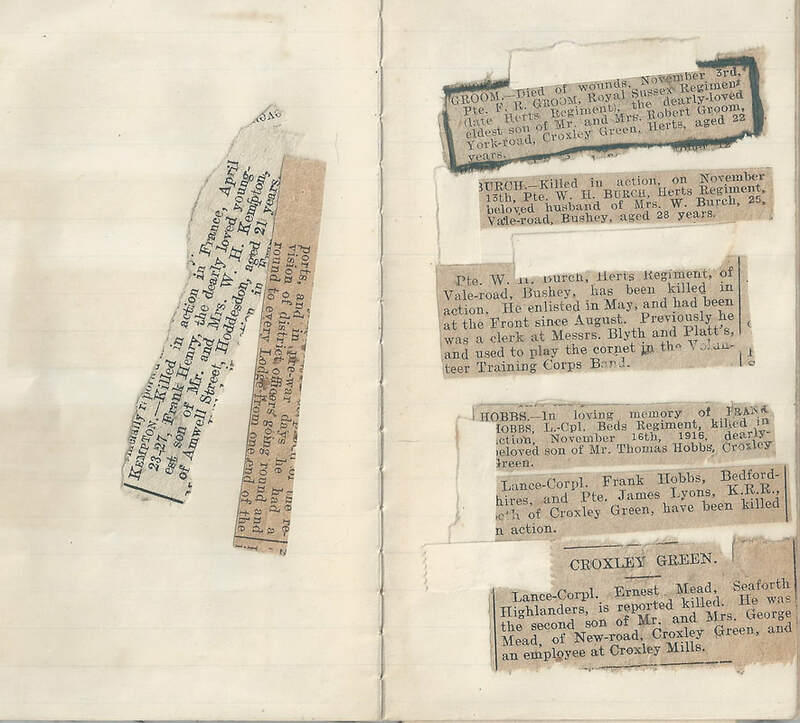 notes and the family believe they are his mother Frances and his brother William,who also served in the army. 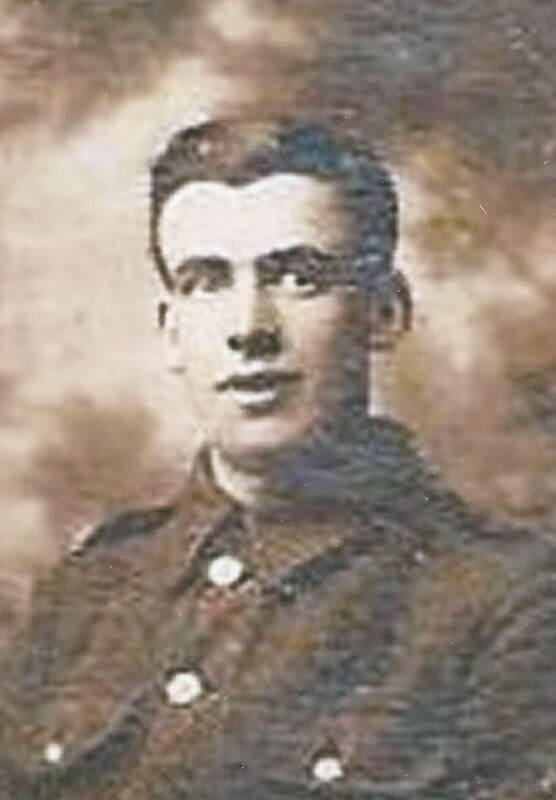 ​When Ernest finally returned home he would have continued recovering from his wounds and lived with his parents and other members of the family. The 1920 Electoral Roll shows the family now occupy 84 New Road. Ernest married Winifred Dora Austin on 3rd April 1920 and they lived at 47 Dickinson Avenue. Ernest continued his employment with the Co-op in New Road and he and Dora,( now using her middle name), had a daughter Brenda.